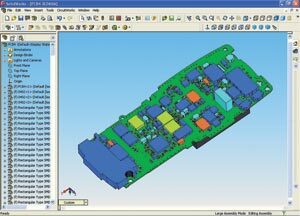 By transferring an accurate model of a PCB and its components accurately into a Mechanical CAD system, users can check for any potential clash between the PCB and its surroundings. If there is a clash, then the PCB shape or the positions of components can altered and the resulting changes saved back out for use with the ECAD system. Complex board shapes can be created in SolidWorks and exported to an ECAD system to be populated with components. CAD models are increasingly used for visualisation and sales use, often before the product itself has been manufactured. The ability to show accurate PCBs with components in visualizations or renderings adds an extra element of accuracy to the image. CircuitWorks can add annotations such as Reference Designators to assembly drawings which can then be used as aids to manufacturing the PCB assembly. The 3D PCB models generated from ECAD data can be used for thermal analysis within Mechanical CAD systems, especially in the case of products with tight packaging constraints such as cellular phones and PDAs where localized heat build up can cause problems. As CircuitWorks is a bi-directional system, assemblies that have been changed in SolidWorks can be saved back out as IDF files to update information in the ECAD system.